What a wonderful day it is (or was, since the sun is already setting) here in Seattle. Beautiful and green and summery. And I’m proud to announce on this lovely day that I’ve finally launched a Kickstarter project to raise money for a graphic novel collection of all my Lovecraft Dreamlands stories! The book will be approximately 176 pages long and will contain Celephais, The White Ship, The Strange High House in the Mist and my long out-of-print Dream-Quest of Unknown Kadath comic series. If I can raise enough money by November 6, the project is a go! In the process, I’m going to go back and retouch Dream-Quest and redraw some bits of the stories (there is a page missing from Strange High House which I need to redraw since I lost the original art, and there are some sloppy panels in Celephais that need redoing). I’m basically going to do the best job on it that I can, and my next job is to work on the cover and the map which will go in the book. If you like my work, please share the Kickstarter link and tell everyone you know who likes Lovecraft. (Or just everyone.) As rewards for backers of the project, I’m giving out sketches, original art pages, copies of the book (natch), a poster map, and an illustrated PDF of “The Club of the Seven Dreamers,” a RPG adventure I wrote as a tribute to Lovecraft’s “Hypnos” and “The Green Meadow”. Anyway, wish me luck! I will be updating this site with new and found material and artwork over the next two months inbetween retouching the old Dream-Quest pages. Please check out the Kickstarter page, and thank you for all your patience and support. I wish you luck. And thank you. I agree, this is a pretty solid page. And a good ending to the story. I hadn’t read it before, and didn’t actually expect it to be so explicit at the end about what actually happened to the old man. Congratulations on getting the kickstarter up and running! As I look at the image on the Kickstarter page, a question comes to mind: you’ve said more than once that you have had, and still have to some extent, difficulties drawing people, and yet you’re amazing at drawing complex people-like monsters like the one in that image, or old men like the one on this final page of Celephais. But when drawing regular people, you tend to use manga templates. What makes them more difficult? Your artwork is amazing, stumbled upon this by chance and have been amazed by how you truly capture the spirit of HP Lovecraft. Great to see the kickstarter page up and running! Have pledged and can’t wait to see how this turns out! Thanks for your kind words, KNO3, DVM949 and Esn!! I’m working now on the cover of the graphic novel, and scanning the pages of Dream-Quest! Thanks for the explanation, Jason. It just seemed weird to me that you’d be so good at drawing realistic noses, eyes, hands, and what have you when they belong to monsters, yet profess to being bad at it when drawing people, since the skills would seem to be the same. Personally, the drawings of landscapes, monsters and old people, when your art seems to adhere to no template, or adhere to one only loosely, is when I like it best. -what sort of binding did you decide to use in the end? Back on pages 8-9 there was some discussion about that. -would it be possible to arrange to receive it from you when you’re at the TCAF next year, instead of paying $10 for shipping to Toronto? Something just occurred to me… this story (Celephais) is a very elaborate “screw you guys, I’m going home”, isn’t it? About the shipping — your question makes me realize, I’m not sure what it costs to ship to Canada. Can I check that and get back to you? I’d be happy to bring it to TCAF too, although I’m not 100% committed to going yet… but maybe! It’s a great show and I love going there and seeing everybody. About the binding, I’m really hoping to go for a matte hardcover, but I haven’t decided the printer yet, I’m still choosing between some options. Some printers weren’t able to do an oversize book, others weren’t able to do a good hardcover… I’d really like the book to be an A4 size hardcover. I’ll announce here and on the Kickstarter when the exact type of cover is figured out. And yes, this is a very misanthropic story. ;) Although I like it more than “The Quest of Iranon”, which has similar themes but (IMHO) isn’t handled as gracefully. I didn’t mean soft or hard cover, actually; I meant how the pages will be bound together. As in, will it be smyth-sewn so that the book can be opened flat and double-page spreads can be seen as they were meant to be seen? A book is mostly for reading and not looking at, after all, so the most important thing to me would be the presentation of the material inside, how comfortable it is to read, etc. And that example seems to be smyth-sewn as well… so, maybe something like that is an option. Potentially, it would be light (less money to ship, as well), durable, and look distinguished. Apparently, smyth-sewing can be done for hardcover and softcover books alike. Googling “smyth sewn softcover” gets plenty of results, anyway. Here’s an image I found: http://china-bookprinting.com/products/Productshow_190.html Unlike that Greek Bible example, the cover there doesn’t look especially durable. The bottom three especially. The bottom one seems to show that it’s possible to make the covers hard, but the spine flexible. And glad to hear that you’re considering TCAF. :) Somehow I just assumed that you were going since you’ll have a book release (or two) this time around… I got the Kadath DVD from you there two years ago, and watching it was an inspirational experience. Concerning shipping, of course. I’m just one of the many Canadians who’s fed up with the shipping rates that we’re often charged by Americans, plus money’s a bit tight at the moment, so I figured I’d ask. Jason, congratulations on finishing Celephais! Well done! Panel four is intriguing (if, again, a bit hard to stomach! )–Kuranes’ left eye is glazed, as if he is looking beyond this world. His right eye, in contrast, is only an empty socket in which the tidal waters ebb and flow…and the crabs in the next panel–ugh! The previous scene is so gloriously transcendental, but my how you bring us back down to earth–this version is even more graphic than Lovecraft’s ending (if you’ll pardon the pun). In fact, it brought to mind the closing scene in Terry Gilliam’s “Brazil”–another story about a man out of his time who is beaten down by the modern world. He seeks to escape it through dreaming, only to find it stubbornly encroaching even into the reality of his dreams. You’re right Ken. I keep finding new things when I look at the panels again. There’s something about Jason’s art that makes his comics eminently re-readable, in contrast to some other artists who strive for economy; their stories are a great read the first time through, but you see everything there is to see after that first time, and so they’re not good re-reads. I could be mistaken but, does anyone else think this story is a likely inspiration for Guillermo del Toro’s movie Pan’s Labyrinth? Offhand, I don’t see any direct correlation between the two stories (other than the endings, which can be read as either triumph or tragedy depending on one’s viewpoint), but Guillermo del Toro is certainly conversant with Lovecraft’s oeuvre so it is possible. Thanks for all your posts, Hermit, Ken, Blodge, Esn & everybody! You’ve put into words what I was just feeling vaguely before… When I was rereading Celephais I was definitely thinking of Terry Gilliam’s Brazil and Pan’s Labyrinth and other movies (and stories, like Ambrose Bierce’s “An Occurrence at Owl Creek Bridge”) where an outsider finds escape in a beautiful dreamworld while in the real world they collapse into doom and death. But of course, if you take the dream stories at face value, it’s all real, so it’s a good thing, right? And yet, this story felt very dark to me, much darker than when I read it first in junior high. And when Carter meets Kuranes in Celephais, although he still exists, he’s also not too thrilled with how things turned out. In “Tour de Lovecraft” Kenneth Hite writes that Celephais is a story in praise of “puerile decadence” (maybe Decadence with a capital D) whereas Dream-Quest ultimately goes more in the direction of realism… maybe that’s the difference, that Dream-Quest recognizes that fantasies are ultimately grounded in reality, whereas Celephais is a pure exultation of the idea of escaping this crumbling world. Oddly enough, I’ve never thought of “Celephais” as being depressing, when viewed as a self-contained story. Certainly the events in “Dream-Quest” cast a pall over Kuranes’ fate, but that story is its own beast. In “Celephais,” we apparently have confirmation that Kuranes’ consciousness now dwells forever in beauty and glory, which is one of the ultimate hopes for almost everyone. His body dies, which would have eventually happened anyway, but what’s getting washed around in the Innsmouth surf is just a shell; Kuranes ain’t there, man. It is certainly a critique of modern society, but I don’t think that makes the story depressing, per se, in the way that 1984 is profoundly depressing. I suppose it could be viewed as depressing if you choose to believe that the entire ending was a dying hallucination by Kuranes, although I think that does violence to the text. All that being said, this was another extraordinary work of art. Thank you so much for these wonderful versions of these stories! And another correspondence that just came to mind. In the Mythos story “The Whisperer in Darkness” , Henry Akeley is apparently the recipient of a horrifying “fate worse that death”–his brain is removed from his skull, encased in a metal canister and carried off into the outer darkness by the hideous Mi-go. It was Fritz Leiber who pointed out that if you read this tale as science fiction (rather than the horror which it is presented as), than Akeley’s fate doesn’t seem all that bad–in fact, it may be something to be envied! After all, as Brian888 points out, we’re all going to kick off one day. When that time comes, I imagine a cosmic escape clause would be mighty welcome. I just today finished reading “The Dream Quest of Unknown Kadath” and I really enjoyed it! Lovecraft seems to have been in a relaxed mood when he was writing it, letting invention and incident appear as the story required it, rather than trying too hard to shoehorn things in. At least that is my impression of the story–I don’t know what was going on in the HPL’s “real world” at the same time. It certainly seems a fond and fitting send-off to the whole “Dreamlands” period of his literary career. As I was reading I kept finding myself smiling as I recognized yet another reference to Lovecraft’s previous Dunsanian tales–not only Randolph Carter, but King Kuranes, Celephais, Ooth-Nargai beyond the Tanarian Hills, the Night-Gaunts, the marble cloud-city of Serannian, Ulthar and its felines, Zar, Thalarion, Sona-Nyl. the Basalt Pillars of the West, Pickman and his fellow Ghouls, Nyarlathotep…it’s practically a “Dreamlands Greatest Hits” album! Jason, your visualization of the environs of Dream helped immensely as I was reading. Does anyone remember the special “H.P. Lovecraft issue” of Heavy Metal magazine? This was back in Oct. of 1979. 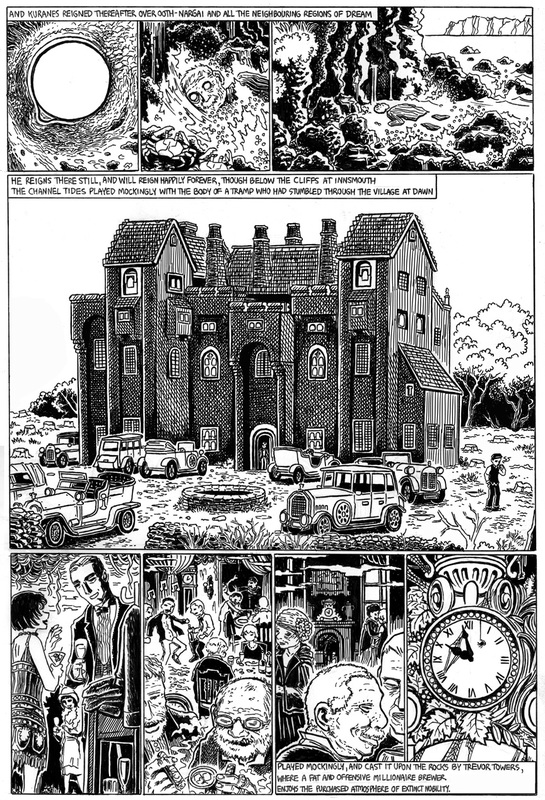 I recall artist Nicole Claveloux adapting a passage from “Dream Quest” in her patented charming/eerie style. I don’t know if she actually adapted the whole story…I didn’t realize what an epic it was. Jason, how many pages did it take you to? I think it’s pretty accurate, although I thought most of the voices were good (possibly a bit flat in the beginning, sometimes). I also don’t think a live-action adaptation would work in the same way at all… it would be a completely different animal. A properly-animated version that kept the same artistic style and everything else, though (possibly re-recording a few of the dialogue lines), would be much welcomed. Thanks for mentioning it! :) As a matter of fact I know the writer, he’s a friend of mine on facebook! Actually, I’ve always thought that a fully-animated Kadath would be a great movie, and in my corrupt way, I’ve even imagined ways you could fluff up the plot to make it more like a conventional story arc…. that’s just my own random musings, though, of course. @Ken — I’m horribly sorry that I somehow missed your email for so long! :/ Now you see why I like Dream-Quest so much! It definitely feels like a “H.P. Lovecraft Classics Collection” sort of mash-up. I think you can almost divide his writing career up into pre-Dream Quest and post-Dream Quest, actually…. it was after Dream Quest that he invented many of his most famous pseudo-science-fiction names & entities, such as Cthulhu (actually invented the summer before he wrote DQ, but close enough), Yog-Sothoth, etc…. whereas Azathoth and Nyarlathotep are the main holdovers from the pre-Dream Quest fantasy period, although they never again play such a central role in his stories. Not that I don’t like his post-DQ work, indeed it’s his most mature writing, but it’s a very different beast. I think I’ve read the 1979 Heavy Metal but it was a long time ago. I don’t remember Nicole Claveloux’s Dream-Quest adaptation. It took me 122 pages to draw the whole thing, although looking back on it now, I wish I’d used another 20 or 30 pages. Jason, no apology is necessary–I know you’re working hard on the collection! I think you are right that “Dream Quest” would need to be tweaked a bit to work as an animated film. “Celephais”, on the other hand, could probably be adapted pretty much as it is, perhaps because it is smaller in compass (and much shorter, of course). In fact, after seeing your graphic adaptation, it struck me that you might be able to get away with doing it as a silent film, with no dialogue at all. I can send you copies of the Claveloux adaptation, if you have a P.O. Box. It’s only a couple of pages long. Hey, you’re an amazing artist and you do an amazing job with the Lovecraft theme, I am a writer in Cambridge, MA and I’m working on some Lovecraftian fiction, I’d love to hire you and collaborate with you on some pieces. I take the view that it’s a bittersweet ending… his fate in the real world is tragic, but he’s where he wanted to be. I would see it as a happier ending if not for how he’s presented in Dream-Quest– even in the Dreamlands he can’t find the happiness he had in his youth, because of course none of us can go back to that.